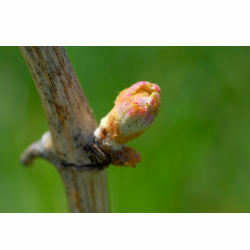 Budding is the first phase of the biological cycle of the vine that usually begins with the blossoming of the buds in March, when the season is half way between winter and spring and the temperatures increase. After long months of rest, the roots of the plant wake up thanks to the milder temperatures that increase the heat of the soil and permit the plant to start vegetating again. The budding phase is influenced by the climate and therefore it can change from year to year. Several other factors such as exposure to sunlight, the drainage of the soil, the age of the vines and the time of pruning, can also affect this important period. Manzoni Bianco 6.0.13 seems to have a rather precocious budding which occurs approximately around the second decade of April.